I found this Sega Saturn advertised for sale on a local newsgroup, being that these consoles seem to have never taken off around here I thought it a good change to get one. At this time I've been able to get 18 games for it and I am always on the lookout for more. I've had some time to play around with it a bit and while the games I have for it are certainly not the best available on this system it doesn't seem all that bad. Certainly the controllers leave a lot to be desired, quite similar to the ones available for the 3DO systems a generation before this system. Out of all the controllers for consoles in this generation (Sony Playstation, Nintendo 64, Sega Saturn) I would have to say that I believe the Nintendo 64's to be by far the best, being both comfortable to hold and easy to use. 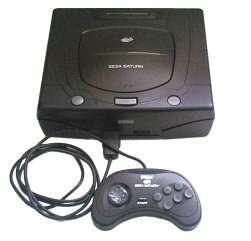 www.sega-saturn.com - This site features a wealth of news, reviews, previews and cheat codes for one of the best consoles that the world has ever seen, the Sega Saturn. 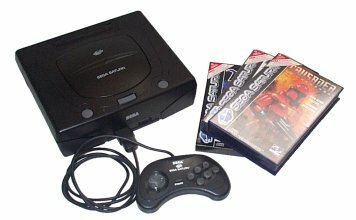 www.classicgaming.com - Online archiving of the Sega Saturn.